Jaco is an artist working out of The Hague, The Netherlands. He studied at the Royal Academy of Fine Arts, as well as at the Escuela Superior de Belles Artes Ernesto de la Carcova in Buenos Aires. 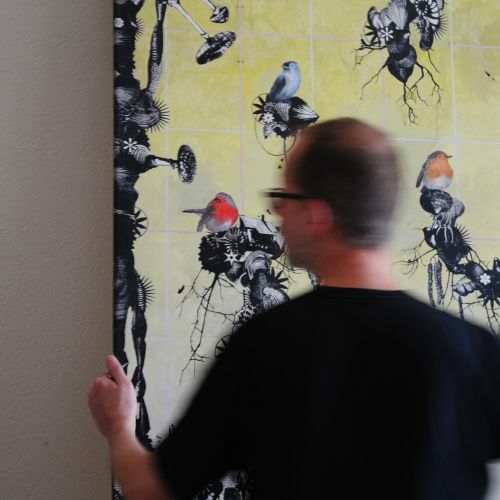 After having tried many disciplines, He have found his niche working in mixed media and printmaking. Jaco's etchings and screenprints are digitally designed and then manually printed in his makeshift studio. Every print and etching is hand pulled and is numbered in a small edition. Putker's work has been exhibited in Holland, Germany, Belgium, Norway, Taiwan, Japan, Australia, Canada and the USA.